MobiRent is a robust Rental Management System for complete management of your rental business. 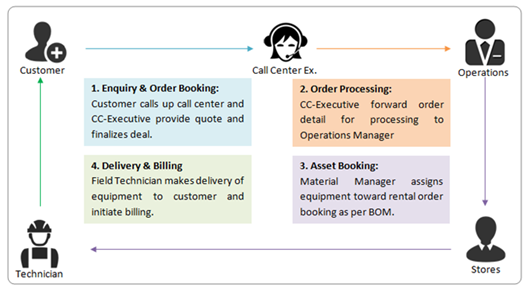 It manages the full cycle of rental operation, right from customer enquiry to quotation, delivery, inventory tracking and receivables. The heart of MobiRent solution is web-based cloud-hosted server software that provides centralized management of rental operations. Plus, there is a MobiRent mobile app for use by your field technician in charge of delivery and support function. The app allows proper inventory control, on-time delivery and accurate billing.